Dahle's professional series of rolling trimmers are designed for heavy duty applications where precision is essential. These trimmers are equipped with a ground self-sharpening blade that cuts in either direction. Most models in this series have a cutting capacity of up to 20 sheets of paper at a time and are perfect for cutting paper, trimming photographs, and large format printing. These trimmers can be wall mounted and the two larger sizes have optional floor stands. Dahle Professional Rolling Trimmers are available in 37.5" and 51" cutting lengths and are a popular choice among professional photographers, print shops and graphic design agencies. Click here if you want to order this trimmer with a stand. Dimensions: 45 1/2" x 14"
It is easy to use and a very precise cutter. Great product as advertised and the best deal I could find online. I will definitely be shopping at MyBinding.com for similar products in the future. This is the Dahle 556 Professional 37 1/2 inch Rolling Trimmer! When the blade passes over the paper clamp it helps keep your pages in place when cutting. There is an adjustable edge guide as well to align your pages with. It can also be move to anywhere on the cutter surface since it’s magnetic. And the blade head can cut from both the left and the right. There are guides for common angles in the center, and even several lengths of common paper sizes. It’s important to mention, that if you try trimming too many pages, it just won’t work. The blade will roll right over them without cutting. This should be used as a precision cutter with only a few pages. If working with larger formats, there are hooks so you can hang a roll and keep your work together. With the stand, cutting larger banners is made easy. And all the trimmings fall below to be cleaned when it’s convenient. You can buy it with the stand, or separate. 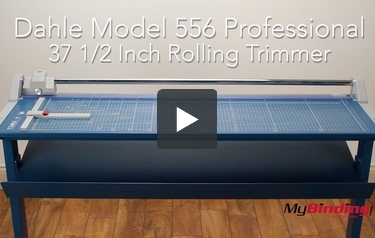 The Dahle 556 Professional Rolling Trimmer is one of the largest cutters you can buy. But is its size the only thing that makes it worthwhile? Read this review and find out so you can then decide if this is the right trimmer for you. The Dahle 556 has a decent cutting capacity for this type of trimmer. It can cut as many as 20 sheets of paper at a time. This makes it good for both small and medium-sized jobs. However, if you need to process a lot more paper on a regular basis, something such as a stack cutter may be a better choice. This trimmer can cut paper that's up to 37.5 inches long. You'll be able to use it for all of your large-format projects (posters, signs, etc.) as well as smaller ones. While the Dahle 556's cutting length makes it able to handle both large and small pieces of paper, it also means that this device will take up a lot of room. This device measures 45 1/2" x 14 1/8" so you might have some trouble finding an appropriate place for it. If none of your work surfaces are large enough, you can purchase a stand for this device. It can also be mounted on a wall which can actually make the cutting process easier. This device's blade is made out of ground steel and it's sharp enough to cut in both directions. It's also self-sharpening. For your safety, the blade is located in a plastic case. This device is equipped with an automatic paper clamp so your sheets will remain in a neat stack when you cut them. This feature ensures that you'll always end up with a crisp cut right where you need it. The Dahle 556 also has an alignment grid and metric and standard units printed on the base so you can measure things before cutting them. The Dahle 556 comes with an adjustable backstop. This feature makes it possible to cut repeatedly. And if you prefer to work with rolls of paper, you can purchase a roll holder which attaches to this cutter. Finally, the Dahle 556 is durably made, thanks to a combination of metal parts. It also comes with a limited lifetime warranty. The Dahle 556 Professional Rolling Trimmer is a great choice if your workplace is in need of a large-format cutter. This device has a decent cutting capacity and its ability to trim paper that's up to 37.5 inches long ensures that it can handle a wide variety of jobs. This cutter is also solidly built and is pretty safe to use, although you should always be careful when using such a device. The only thing that might be a problem with this cutter is its size. Luckily, you have the option of using a floor stand or mounting it if your work surface isn't big enough. All together, the Dahle 556 is one trimmer worth checking out. Take a look at it today. How much does this piece weigh? I am looking to put it on an adjustable tray under a table for space saving. Thank-you! Thank you for your question. The Dahle Model 556 Professional 37 1/2 Inch Rolling Trimmer is 19lbs. Can this machine do scoring? Thank you! Thank you for your question. Unfortunately there is not a scoring blade/wheel available for the Dahle Model 556 Professional 37 1/2 Inch Rolling Trimmer. Have a problem with the trimmer clamp, right side does not go into the slot on the right side and remains loose, is this common or is the plastic clamp to short. To address technical issues the best first step is to contact the manufacturers technical support department. They would best be able to if this is a defect in the cutter you received or if it is something that can be addressed with a little tech support. The manufacturer is Dahle and their phone number is 1 (800) 995-1379.